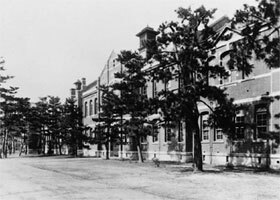 The Main Building of College of Science and Technology in early 1900s on Yoshida Campus, where the Department of Chemistry was first located. The history of the Department of Chemistry at Kyoto University began with the founding of the College of Science and Technology, Kyoto Imperial University on June 18, 1897. As depicted on the Historical Timeline, the Department has undergone several organizational changes to meet the scientific and educational needs and challenges that have risen since its founding. For example, the Department was reorganized as Undergraduate Department and Graduate Division of Chemistry in 1994 to facilitate the graduate studies’ program and the number of the laboratories has gradually increased from the original four in 1914 to the present twenty-nine in 2009. Altogether over 3000 students have graduated from the Undergraduate Department and the Graduate Division of Chemistry since the founding. Most graduates have gone onto academia, research institutions, and industries, where they have led and/or are engaged in original research in various chemistry-related fields, from the fundamentals in science, to engineering, pharmacology, and medicine. A number of our alumni have been involved in advanced research projects at internationally recognized institutions in Japan, as well as overseas, and they have made important contributions through their scientific discoveries. Several have received distinguished awards including the Nobel Prize. We encourage the involvement of our graduate students and young faculty members in international scientific activities. A significant number has actively participated in the international exchange programs and scientific conferences through the support of the 21 COE (2002-2007) and Global COE programs (2007-present). According to Thomson Reuters, Kyoto University ranks first in Japan and fourth in the world in Chemistry in 2011. Kyoto Imperial University was founded by the Imperial Ordinance on the 18th of June 1897, the second Imperial University to be established in Japan. College of Science and Technology was founded. Department of Pure Chemistry and Department of Applied Chemistry were established and the undergraduate program in Chemistry began. The former Department was started with both the Laboratory of Theoretical and Physical Chemistry and the Laboratory of Organic Chemistry. The latter was with the Laboratory of Organic Manufacturing Chemistry and Inorganic Manufacturing Chemistry. College of Science and Technology was divided into the College of Science and College of Engineering. The affiliations of the Department of Pure Chemistry and Department of Applied Chemistry changed to the College of Science and College of Engineering, respectively. The Alumni Association of Chemistry Graduates of College of Science in Kyoto Imperial University (Kyoto Kagaku Gakushikai or abbreviated as Keika Gakushikai) was founded. The College of Science was renamed as the Faculty of Science. Laboratory of Solid State Physics and Chemistry was set up. Laboratory of Biological Chemistry was set up. Laboratory of Analytical Chemistry was set up. Laboratory of Metallurgy was set up. The new university system was implemented, under which the 4-year-undergraduate program and 2-year master's course and 3-year doctoral course were implemented. The research area in the 4th Laboratory was changed from Organic Electric Chemistry & Analytical Chemistry to Quantum Chemistry. Laboratory of Radiation Chemistry was set up. Laboratory of Structural Chemistry was set up. Laboratory of Spectrochemistry was set up. Department of Chemistry was relocated to the Faculty of Science Building I on North Campus from the Department of Chemistry Building on Yoshida Campus. Laboratory of Synthetic Organic Chemistry was set up. Laboratory of Organic Chemistry of Molecular Assembly was set up. Laboratory of Theoretical Chemistry was set up. The Division of Chemistry, Graduate School of Science was organized by the national policy of Jutenka, a policy shifting the institutional emphasis from undergraduate to graduate level education. The Division was comprised of 14 laboratories from the Department of Chemistry, 8 laboratories from Institute for Chemical Research, one laboratory from Virus Institute, and one laboratory from Nuclear Reactor Laboratory. Laboratory of Spectrochemistry was renamed as Laboratory of Organic Solid State Chemistry. Laboratory of Analytical Chemistry was renamed as Laboratory of Physical Analytical Chemistry. Laboratory of Structural Chemistry was renamed as Laboratory of Biological Structural Chemistry. Laboratory of Solid State Physics and Chemistry was renamed as Inorganic Solid State Chemistry. The 100th anniversary of the founding of the Department of Chemistry was celebrated. Kyoto University Alliance of Chemistry, a frontier educational program for graduate education for chemistry initiated by the members of the Department/Division of Chemistry was selected as the 21st Century Center of Excellence (COE) Program. Laboratory of Electric Spin Chemistry was set up. Laboratory of Inorganic Chemistry of Materials was set up. National University Corporation Kyoto University was established as National University Corporation Law was implemented to all national universities in Japan in April, 2004. The Department/Division of Chemistry was relocated from Science Building I to Science Building VI. The 21 COE Program, Kyoto University Alliance of Chemistry, was completed and received the top rating in the chemistry and materials science division of the Program. The five-year Global COE program, International Center for Integrated Research and Education on Materials Science, began. The bylaws of Keika-Gakushikai, the Alumni Association of the Chemistry Department were amended. Laboratory of Molecular Materials Science at the Research Center for Low Temperature and Materials Sciences joined the Division. The Graduate School of Science Seminar House was constructed. The funds raised by the Keika-Gakushikai to commemorate the 100th anniversary to the founding of Chemistry Department went to support the construction of the Seminar House. The General Meeting of the Keika-Gakushikai was held at the Seminar House on June 25. Laboratory of Organic Solid State Chemistry was renamed as Solid-State Chemistry. Laboratory of Fluid Chemistry of Materials was set up. Laboratory of Molecular Materials Science joined the Department of Chemistry, as a result of the Research Center for Low Temperature and Materials Sciences' disbandment. On October 1st 2016, Institute for Virus Research Kyoto University and Institute for Frontier Medical Sciences Kyoto University were merged into Institute for Frontier Life and Medical Sciences Kyoto University. Laboratory of Solution and Interface Chemistry was renamed as Chemistry of Functionalized Surfaces.